You can't get there from here - read my recent article titled, "The Practical Project Plan - Leadership Through Pragmatic Detail Management"
The Art of Nonsense - please read, "Misguided Leaders - Preventing the Incursion of Bad Influence." Portal – The portal acts as the gateway, knowledge base, and application launch pad. Function – A business function is a name or phrase used to describe a process (using business oriented terminology). Functions are typically listed in the portal as specific, role defined activities. For example, an insured customer (role) working in the portal would click on the "file claim" (function) to start the claim filing process. Process – The Process Model or Definition describe business function by setting boundaries around and relationship between one or more tasks. Tasks are related to other tasks and roles(workers). In a process model, roles are typically represented as lanes. Roles may include both people (e.g. adjuster) and automated sub-systems (e.g. check writer). Service – A service represents the implemented task. Services are orchestrated into and deliver value towards the completion of a business process. Services implement tasks through various technologies such as web-based user interfaces (forms), tracking, automation, and transaction management. The service also represents both a single and agregate (orchestrated) capability. A collection of orchestrated services are typically bonded together by yet-another, high-level service. Business Process Execution Language (BPEL) may also be used to define the execution flow between these aggregated services. 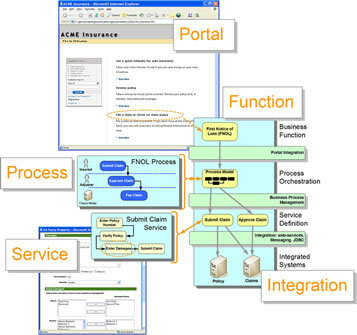 Integration – Integration is the result of connecting a service to one or more underlying enterprise resources. Copyright ©2007 Gary Samuelson, All Rights Reserved.